As provided to the 80th Indiana Website. As enhanced by Deep Vee Productions. 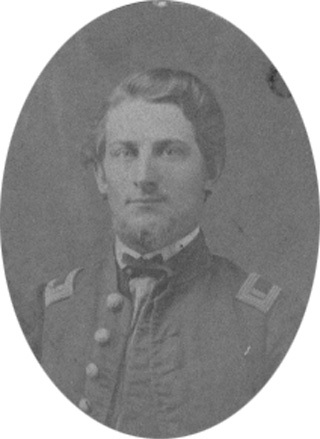 This image shows him wearing a civilian bow tie and a navy blue wool Union Army officer's uniform jacket with the insignia (the 'shoulder straps') of a 1st Lieutenant. The original image is believed to have been taken sometime between September 1862 and October 1863. An electronic copy of the original image, and written permission to post it on the 80th Indiana website, are courtesy of Brian and Triva Schrader. Alfred was a resident of New Harmony in Posey County, Indiana when he was commissioned by Indiana Governor Oliver P. Morton as a 1st Lieutenant and Adjutant of the 80th Indiana. He was mustered into the Union Army at that rank for a 3 year term of service on September 4, 1862 at Camp Gibson near the town of Princeton in Gibson County, Indiana. 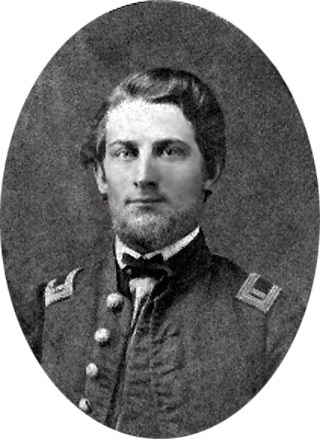 He was promoted to be the Lieutenant Colonel (second in command) of the 80th on October 15, 1863 and to be its Colonel (commanding officer) on June 27, 1864. He mustered out of the Army with the other surviving members of the 80th on June 22, 1865 when the 80th was disbanded after the war ended. All Rights Reserved. Created December 29, 2004. Last updated December 29, 2004.